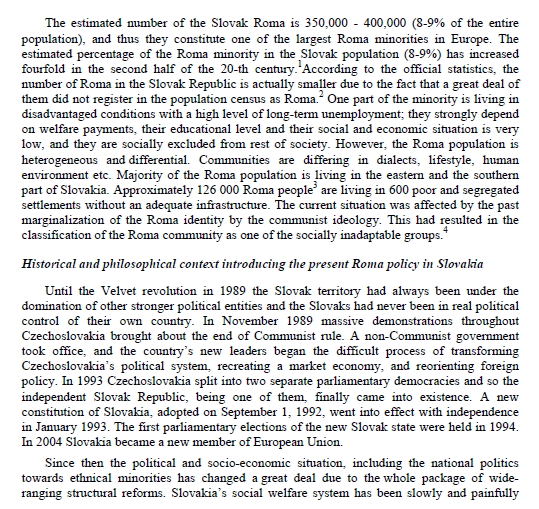 The estimated number of the Slovak Roma is 350,000 - 400,000 (8-9% of the entire population), and thus they constitute one of the largest Roma minorities in Europe. 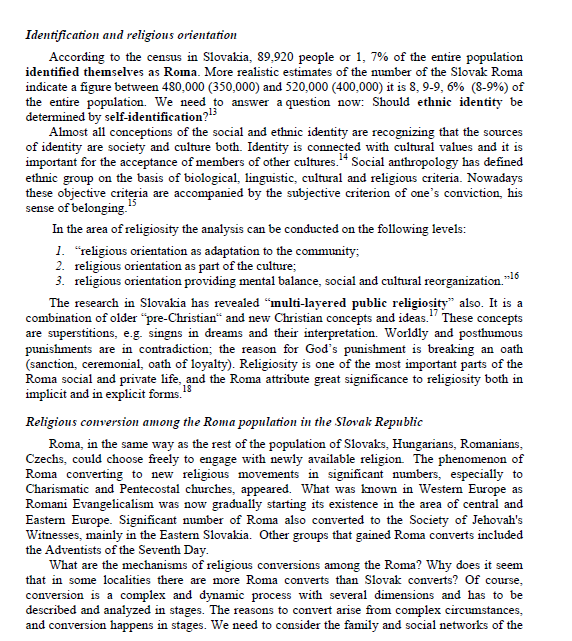 The estimated percentage of the Roma minority in the Slovak population (8-9%) has increased fourfold in the second half of the 20-th century.According to the official statistics, the number of Roma in the Slovak Republic is actually smaller due to the fact that a great deal of them did not register in the population census as Roma. One part of the minority is living in disadvantaged conditions with a high level of long-term unemployment; they strongly depend on welfare payments, their educational level and their social and economic situation is very low, and they are socially excluded from rest of society. 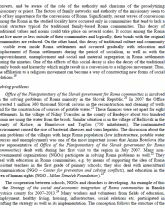 However, the Roma population is heterogeneous and differential. Communities are differing in dialects, lifestyle, human environment etc. Majority of the Roma population is living in the eastern and the southern part of Slovakia. 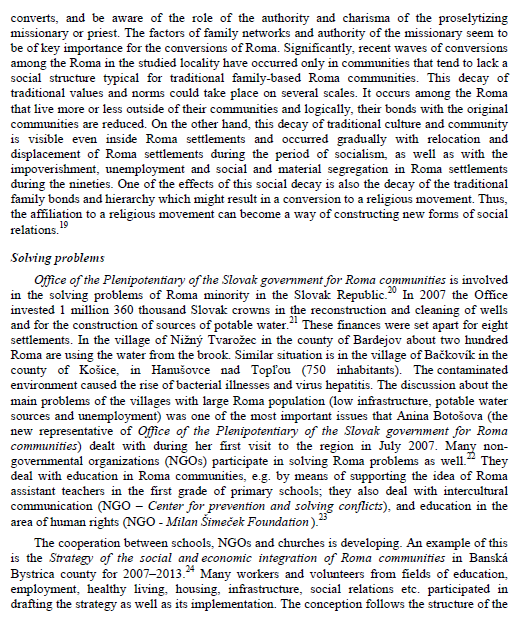 Approximately 126 000 Roma people are living in 600 poor and segregated settlements without an adequate infrastructure. The current situation was affected by the past marginalization of the Roma identity by the communist ideology. 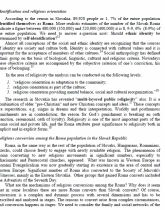 This had resulted in the classification of the Roma community as one of the socially inadaptable groups. BACOVÁ, V. Etnická identita a historické zmeny. Štúdia obyvatelov vybraných obcí Slovenska. Bratislava : Veda, 1996. p. 12. BARANY, Z. The East European Gypsies. Regime Change, Marginality, and Ethnopolitics. Chapter 5- The Socioeconomic Impact of Regime Change. Demography. Cambridge: Cambridge University Press, 2002. Co sa osvedcilo? Výber z rómskych projektov v strednej a východnej Európe. Bratislava : Partners for Democratic Change Slovakia, 2003. ISBN 80-968934-1-6. 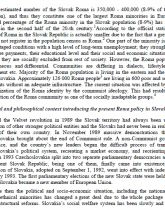 JAURA, D. Young People in Postmodern Society: A survey of spirituality of the coming generation in post-communist Europe. Bratislava : CityGate, 1997. 44 p.
KUŠNIERIKOVÁ, N. ed. Rómovia, vzdelávanie, tretí sektor. Bratislava : PDCS, 2001. LIVECCHE, M. Every Knee Shall Bow : An Inquiry into What Masters Us. Bratislava : CityGate, 2004. 77 p.
NOBLE, I. Churches in the Post-Communist Countries and Democratic Citizenship. In Europe, Democratic Citizenship and Education. Otepää : ICCS, 2006. 14 p.
RADICOVÁ, I. Hic Sunt Romales. Bratislava : S.P.A.C.E., 2001.